Brazilian born pianist Derison Duarte has received much acclaim for his performances throughout the United States. Audiences and critics alike have praised his daring virtuosity and poetic style. Mr. Duarte has performed more than a dozen works for piano and orchestra and his list of engagements include the Saint Louis Symphony, Missouri Symphony, Corpus Christi Symphony, Indianapolis Chamber Orchestra and Boise Philharmonic. Mr. Duarte has been invited to present recitals as a guest of the Dame Myra Hess Series in Chicago, the Oberlin College Conservatory, the Boston Conservatory, Duke University, Brown University, the Seattle Arts Museum, the Maestro Foundation Series in Santa Monica, and the Bunka Kaikan Series in Tokyo among others. He has been featured on NPR’s Performance Today performing works of Chopin, and has made numerous other radio appearances. 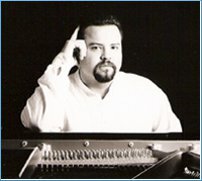 In addition to winning the 1997 American Pianists Association Fellowship, Mr. Duarte has been a major prize winner in many national and international competitions including the Missouri Southern International Piano Competition, Kingsville Young Performers International, Nena Wideman Concerto Competition, Grace Welsh Prize for Piano, and Young Keyboard Artists International as well as a laureate of the Gina Bachauer International Piano Competition. Currently, Mr. Duarte teaches at the University of North Carolina at Chapel Hill, North Carolina Central University and Duke University. His previous faculty positions include The School for Creative and Performing Arts in Cincinnati, The Colburn School of Performing Arts and the Interlochen Arts Academy. Students of Mr. Duarte have frequently performed in recital, participated in festivals and been offered significant scholarships to attend many of the country’s most prestigious schools of music including the Eastman School of Music, the New England Conservatory of Music, the Manhattan School of Music, the Oberlin Conservatory, the University of Southern California, Indiana University and the Cleveland Institute of Music, among others. Mr. Duarte’s students have also been awarded first prize at the East Carolina University Young Artist Competition, the North Carolina Symphony Kathleen Price and Joseph M. Bryan Youth Concerto Competition, the Winston-Salem Symphony Peter Perret Youth Talent Search Competition, the Chapel Hill Music Teachers Association Festival, the Durham Music Teachers Association Festival, and appeared as guests on NPR’s “From the Top” and with the Cincinnati Pops Orchestra.